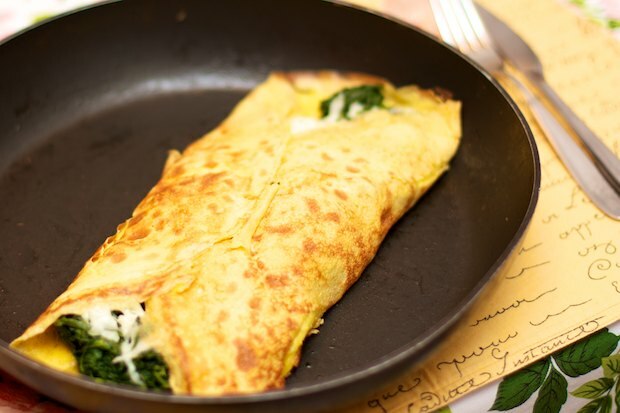 The French omelette is an elaboration of our simple omelette. This recipe can be used often when you have children at dinner. An omelette can hide things that are good and healthy that children normally don’t like. This recipe uses frozen spinach. I recommend that you choose spinach packed in cubes so you can buy a large batch and use the portions you need, leaving the rest in the freezer, so that it is ready for other recipes. This recipe provides a lot of nutrition without spending too much. Thaw the spinach according to the instructions on the package. When it is cooked, squeeze it so that it contains the least amount of water as possible. In a bowl, break the eggs and beat them with a whisk, add the flour and milk, a little salt, and pepper if you please. Beat with a whisk until smooth to make the omelette mixture. Heat up a nonstick pan with the butter. When it is hot, add the egg mixture and allow it to brown, this should take about 10 minutes. 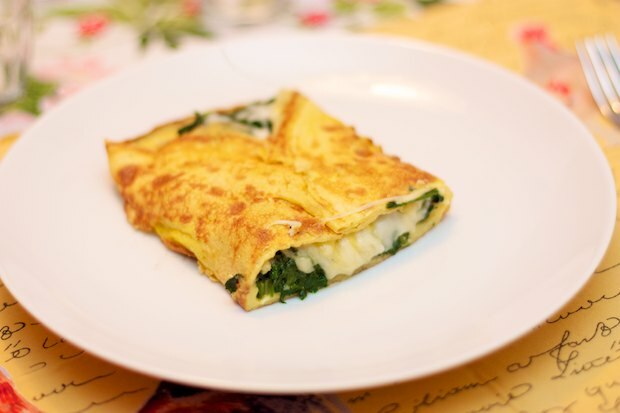 Check the bottom, lifting the edge, and when it is golden, turn down the burner to minimum and arrange the spinach and cheese cubes in the center of the omelette. Fold the two flaps of the omelette to form a pouch. Turn off the heat. Cover with a lid and let the cheese melt for approximately 8-10 minutes. Cut the omelet into four portions and serve. Posted in Eggs and tagged with French Omelette with Spinach, Omelette con Spinaci. RSS 2.0 feed.